Toad lilies have become increasingly popular in the last few years, as gardeners have fallen in love with their orchid-like blooms. 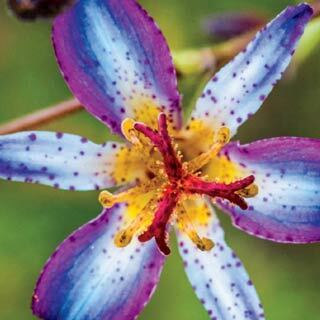 Toad lilies bloom in late summer or early fall, providing an exotic display just when other flowers are dying back. Most Popular Colors: Purple, blue, yellow, white. Blooming Season: Late summer to early fall. Soil Preferences: Rich, slightly acidic soil. Climate Preferences: Toad lilies are winter-hardy in areas in which the winters don’t drop below 0 degrees. Landscaping Tips: Where to plant these small-but-magnificent flowers? Anywhere with shade. Toad lilies prefer a woodland setting, but shade provided by overhanging trees or structures will work. Planting: Plant astilbe 18 to 24 inches apart, and water in well. • Water toad lilies generously (twice per week or more) to keep the plants constantly, uniformly moist. • Consider adding mulch to control weeds – toad lilies will love being watered, but unwanted growers will sprout with the same exuberance.